A video / 3D animation of the soundfields from the Brodmann speakers, of the ASB, the low- / mid-range speakers and the tweeters. The main goal of conventional technology is the elimination of resonances by heavy damping and flattening of the frequency curve by powerful crossover filtering. This pays surprisingly little regard for the sound itself. Unfortunately, no difference is made between undesirable and desirable resonances. The basic acoustic principle remains: Without resonances, there cannot be lifelike sound. Music is played by instruments; hence authentic sound reproduction must also require instruments featuring harmonious resonances. While conventional loudspeakers produce illusions, they fail to sound lifelike, since all resonances have been eliminated. Brodmann loudspeakers are instruments in themselves. Of course they don’t employ active resonators with instrument-specific sounds, as musical instruments do, but instead they use passive resonators, creating a neutral sound. It is only through this coupling that the resonators or absorbers are brought to vibration (after Hermann Ludwig Ferdinand von Helmholtz, inventor of the “Helmholtz Resonator”). Reproduction of essential resonances is one secrets of the lifelike Brodmann Acoustics sound. The sound produced by musical instruments can only be authentically reproduced by instruments of the same kind. The difference between musical instruments and loudspeakers is that musical instruments produce their own characteristic sound in the form of specific sound patterns, while the loudspeaker’s task is to reproduce a perfect, true-to-life copy of this characteristic sound. Take string instruments as an example: the resonance stimulators, in this case the strings, are firmly attached either to the soundboard or the instrument’s body – stretched over the metal frame on the piano and over the bridge and tailpiece (between the ƒshaped sound-holes) on members of the violin family. An instrument’s soundboard, which produces its characteristic sound, is considered to be an active diaphragm. The drivers in loudspeakers are resonance stimulators; they produce longitudinal waves thereby creating one front and one rear sound field at opposite phase locations. These two sound fields must be kept isolated from one another to prevent acoustic shortcircuits as frequency decreases. Sufficiently large sound walls or cabinets must house the bass drivers; they behave like strings in string instruments – like resonance stimulators. Loudspeaker cabinets which authentically reproduce the sound characteristics of an instrument are passive diaphragms themselves. The performance of both passive and active diaphragms depends on their composition (wall thickness, stiffness, specific weight and internal density of the material) as well as the energy level produced by the resonance stimulator. Since Brodmann VC loudspeakers feature low-vibration bodies and tunable Acoustic Sound Boards, they represent the best solution for true-to-life sound reproduction. Minimal acoustic distortion: while cabinet damping absorbs over-resonances, the damping material produces non-linear effects (the lower the frequency the less effect is achieved). Minimal electronic distortion: while fine-tuning of the sound may be accomplished by frequency filters, the overall frequency curve must be kept as linear as possible. Optimal bass range adaptability to the listening room: Large diaphragms reproduce delicate sounds rather imprecisely and require overly large cabinets. Reproduction of the original resonance, or the original timbre: minimal damping, yet adequate absorption of over-resonances. Absorption of unwanted floor and room resonance (low-frequency footstep noise and standing waves) Sound field with original radiation pattern, frequency-dependant Faced with all these conflicting conditions, conventional technology is incapable of addressing all of them simultaneously. Therefore HD’s comprehensive concept has found new approaches. HD developed his patented HornResonator from the ‘Helmholtz Resonator Principle’. This principle states that a loudspeaker drives the air mass in the cabinet like a spring; this ‘springy’ air mass is attached to a resonator tube containing air equal in weight to the bass diaphragm. The disadvantages of this construction are A) that the opening created is quite small and B) that the resonance point falls on the fundamental resonance frequencies. The HornResonator, however, has many advantages: It is horn shaped and extends from the resonator tube; there is a narrowing, ‘deep bass filter’ at the horn’s small end, which becomes proportionally larger all the way to the large end. This allows the total bass projection area in the listening room to be increased with a minimum of sound distortion. 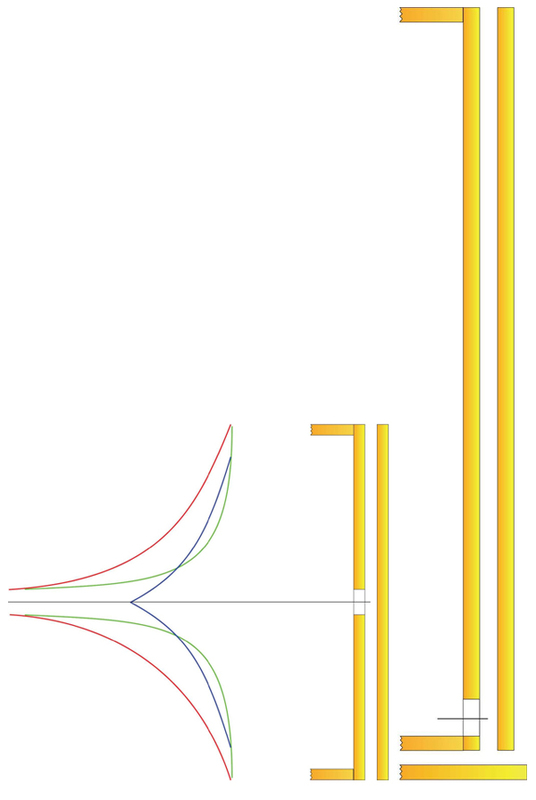 The ‘deep bass filter’ at the beginning of the resonator tube ensures the correct frequency range, preventing sound coloration caused by the horn. To prove that the air mass in the HornResonator truly functions as a diaphragm, and not just as an air funnel, one may simply hold a flame in front of it and observe how it waves in time to the music. Only actively vibrating particles can cause other media to vibrate. Furthermore the angle of the HornResonator’s form enables the production of not just one fundamental resonance tone, but of many varied resonance tones spread across the entire bass spectrum. Finally, a natural acoustic frequency division takes place at 130 Hz. Frequencies above 130 Hz are projected by the low mid-range’s front sound field, while the bass driver’s rear sound field drives the HornResonator. 130 Hz are located in the critical fundamental tone area where it is especially important for sound to be as distortion-free as possible (see 3.2 ‘The Acoustic Active Crossover’). Minimal bass distortion is the basis for producing natural sound. No matter how well constructed a loudspeaker is, it will fail to produce a natural sound without the HornResonator’s high precision level. To learn more about improvements in bass range adaptability to the listening room, please refer to ‘The Horn Function’ in APPENDIX B. The second-generation HornResonator has ushered in a new era in sound reproduction and clearly outperforms the first generation in quality as well as in bass and mid-range reproduction. Instruments are made up of small sound stimulators (i.e. strings, mouthpieces, reeds, etc.) coupled with large resonators and projection surfaces for projecting the sound into the room. Singers make an extremely poignant example of the necessity of resonators, for only after learning how to implement their resonator through years of training, do they find their true voice. Using musical instruments and human voices as models, our loudspeaker research and development has moved away from bass drivers with large diameters to significantly smaller and more powerful designs. Bösendorfer loudspeakers now employ powerful 130 mm bass drivers coupled with large Acoustic SoundBoards of the second-generation HornResonator. The Acoustic SoundBoards feature a ‘double output’ function: Air floats between the cabinet and the board (see APPENDIX A). The boards function as active sound-producing diaphragms with no over-resonances. The normally passive Acoustic SoundBoards vibrate thanks to the defined distance from the cabinet. The advantage of Acoustic SoundBoards compared to ‘passive radiators’ is the increase in impulse dynamics, and thereby the decrease in after-vibrations. This effect is caused by their acousticpneumatic coupling with the bass drivers. Acoustic SoundBoards are freely vibrating diaphragms which are capable of expanding their diameter. Their amplitude can be modified by adjusting the clamp bolts, creating an effect similar to stiffening the sound board of a Bösendorfer Grand Piano. Both the natural sound field’s projection at the original performance as well as the acoustic characteristics of the listening environment are taken into consideration by the different sound projection of the tonal ranges: Bass tones naturally form spherical waves and are projected on a large scale by the Acoustic SoundBoards, driven by the bass driver‘s rear sound field. With midrange tones, the spherical radiation waves of the original sound can be fully taken into account. The placement of the low mid-range drivers on both sides allows mid-range frequencies to be reproduced in spherical waveform via the front sound field. In this way the sound is formed by direct sound and reflection. High frequency tones are club-formed, which makes direct positioning of the tweeters an absolute necessity. If broader radiation patterns were used, unwanted reflections in the listening room would lead to phase errors, since in most cases the listening room is smaller than the place of the original recording, e.g. a concert hall, an opera house or a jazz club. Die neuen Grills vor den Tönern bei der Festival und JB.-Linie verbessern, auch optisch ungewöhnlich ansprechend, mit ihren Soundrods, die klangliche Abstrahlung im Sinne von musikalischen Instrumenten, indem sie - wie erweiterte Membranen – mitschwingen. Weiters wirken sie noch als akustische Linsen (Dispersion). (Such an effect can also appear if you use LS- and NF cables which do not open the sound enough.) However, the optimal musicality is reached by the lateral arrangement of the low midrange drivers - also in the reproduction. The low mid-range drivers are arranged symmetrically for each pair of loudspeakers. Even if a loudspeaker pair is placed symmetrically in the listening room, there will be differences in the distance between each driver and the surrounding walls. Acoustically, compensating for such irregularities requires an excellent distribution of resonances. The distance between the low mid-range drivers and the tweeters is precisely defined to keep phase distortion between the two systems at an absolute minimum. Cabinet damping is often misunderstood. Typically cabinets are literally stuffed with damping material in order to muffle resonances. Resonances, however, may easily be brought under control by other means such as intelligent cabinet structure, angled or specially-shaped walls and use of alternative materials. In this way all non-linearity in the damping can be avoided since the effectiveness of any kind of damping material decreases at lower frequencies. This creates non-linear damping relationships (a fundamental law of acoustics). Brodmann loudspeaker cabinets contain no additional damping material; their proportions are CADCAM-designed before being acoustically and empirically optimized. 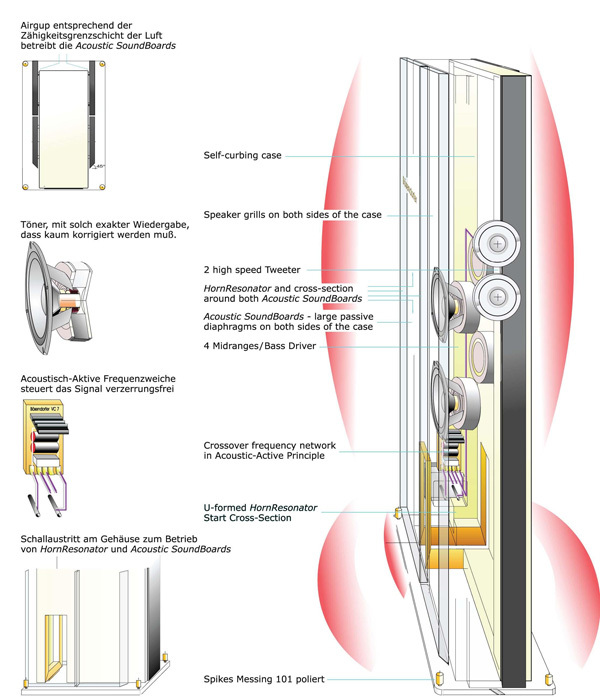 In this way, the cabinet proportions themselves are a major factor in sound reproduction. The result is a sound of unbelievable lightness and airiness. The Acoustic Active Crossover was developed by HD in 1973. Until then, acoustic pressure as a function of frequency had been the main factor in loudspeaker and crossover design. The correlation between crossover design and resulting sound was negligible. Once phasemodulated distortion was taken into account by the design, the results were striking. In the following years, amplitude, frequency, intermodulation and pulse-modulated distortion were additionally taken into consideration. Although these individual types of distortion may be measured separately, they actually act simultaneously, multiplying their effects. Modulation distortion greatly affects sound, its emotion and its very feeling. For example, a violin’s vibrato is itself a modulation; the lower the modulation distortion is, the more convincingly it is reproduced. Only crossovers up to the first order produce linear distortion. When higher order filters are used, pronounced positive effects are offset by non-linear distortion. This was the beginning of the Acoustic Active Crossover, where cabinet and drivers are so perfectly matched together that minimal correction using only a purist crossover filter is required. In Bösendorfer VC loudspeakers, bass drivers operate over their entire frequency range and achieve the desired frequency on their own; the tweeter is marginally corrected. The transition between bass and mid-range is accomplished by ‘Acoustically Active‘ control alone. Whenever possible, the bass driver is left unfiltered; if this is unavoidable, a small coil is used. The tweeter is delicately corrected at its lower end. Together, these make up the complete frequency filter system. With the Acoustic Active Crossover a stunning three-dimensional sound is possible. The tuning have to include obvious excellent measuring results, but have to be done acoustically with the experience of musician and sound engineer. By ‘The Pure Voice’–system (TPV) HD130 Midrange-Woofers are working nearly without mass – are swinging free in space. TPV support so the marvelous dynamics and splendour of singers and instruments in the direction of originally sound patterns. Electrically they are working in a full range manner but acoustically the effect of the acoustic short circuit lets reach a highpass filter function free of any distortions! So the system include also a phase-shifting function. Brodmann loudspeakers are typical two-way systems combining low and mid-range drivers and tweeters to produce as little distortion as possible. Impedance corresponds to the number of speakers used. We use electro-dynamic speakers since these are best suited to satisfy a variety of criteria. No other system can move the air mass so homogenously through the diaphragm. Neither ion drivers, ribbons, nor electrostatic or magneto static designs can achieve such balanced results. These designs all face non-linearity in dynamics, which at lower frequencies leads to insufficient amplitude in relation to the moving surface area, causing uneven airflow. In electro-dynamic speakers, the voice coil operates within a permanent magnetic field, converting the induced tension into mechanical vibrations. These vibrations then move through the diaphragm homogeneously and with little inertia loss, stimulating the air to vibrate. The maximum audible frequency range is 20 Hz – 20 kHz (a wave-length of 16 m to 1.6 cm). Apart from hearing loss of higher frequencies in the elderly, the human ear remains capable of distinguishing fine nuances within its hearing range for quite some time. To reproduce the full audible spectrum with as little distortion as possible, both low midrange and high-range drivers are required. Especially at lower frequencies, implementation of the ideal diaphragm area becomes increasingly difficult. Sound waves of 16 meters would require an equivalent 16 m diaphragm diameter! As compensation, special sound guiding is necessary. The lower the frequency and the larger the wavelength, the more sound guiding will be required (and vice-versa). Following this thesis, HD developed the HornResonator with Acoustic Sound Boards to act as an additional sound guide for lower frequencies, achieving inertia-free surface area enlargement for unhindered dynamics. The upper frequencies are of course unaffected, operating without the use of sound guides. One of the Acoustic Active Principle’s fundamental goals is distortion minimization, as opposed to distortion correction by crossover filters, which actually produce new distortion. So we had to create speakers which, by correct dimensions and design, were capable of achieving all the desired frequencies. Magnet size, voice coil power and heaviness or lightness of diaphragm alone is of little importance for optimal loudspeakers – rather a balanced combination of these variables is the primary factor for ideal loudspeaker construction. In addition, Brodmann bass drivers are extremely powerful in order to drive the Acoustic Sound Boards. The basket must be as rigid as possible in order to adequately complement the speaker’s kinetic energy. Steel, and not magnesium as found in many speakers, is best suited to this task. Diaphragm movement creates opposing forces corresponding to kinetic energy in proportion to amplitude. These forces must be suppressed, which requires use of rigid, sturdy baskets, featuring steel joints and correspondingly strong sound walls (bass speaker mounting surfaces). That’s why our sound walls are so massive and why we don’t use ‘flexible’ cardboard or plastic inserts between the speakers and the mounting surfaces. Air-gap focused magnets featuring smaller air gaps are clearly preferable to sintered ‘artificial magnets’ with their relatively large air gaps. This is because magnetic performance decreases with increasing air gap size at an exponential rate. We primarily use Kevlar voice coil mounts, a material which is rigid yet lineardamped. It’s typical of our commitment to quality that we use 6-ply voice coils featuring maximum electrical conductivity as well as custom-made, flexible voice coil connecting wires. The paper-maché method has proven itself to be the best for bass diaphragms, with linear resonance characteristics and harmonious damping qualities. Our diaphragms are created like fine hand-made papers: they are soft inside, for optimal damping, and hard outside on the radiation surface, for optimal sound projection. These dual benefits are made possible by a sophisticated contactform technique – easily visible in the hard, structured diaphragm surface of the 130 mm low mid-range drivers. Our diaphragms contain carbon fiber for high rigidity and Alaskan hemp for smoothness. The suspension isn’t made of rubber, but rather of UVresistant Styrofoam, which is practically free of self-resonances. Plastic diaphragms are not used at all due to their non-linear resonances – just imagine a plastic violin! While consciously ignoring the recent fashion for metal, Brodmann was one of the first speaker manufacturers to use silk fibers soaked in acrylic. The advantage is a diaphragm which is rigid for fast impulses and soft against unwanted resonances. The 4-ply voice coil delivers extremely fast attacks which are required to keep pace with the HornResonator’s bass tones. The slender voice coil connecting wires are reinforced and very flexible. Both the bass drivers and the tweeters employ magnets with tiny air gaps for optimal flow. This leads to maximal conversion of energy into acoustic pressure instead of a substantial loss of energy as heat, as with conventional speakers. First of all the bass drivers should run at as high a frequency and the tweeters at as low a frequency as possible. In this way the ‘cut-off‘ frequencies and thereby the modulation distortion are both kept to an absolute minimum. In practice we are confronted with certain limits: approximately 2 kHz is the ‘sound barrier’. But this isn’t feasible with conventional loudspeakers, neither with respect to frequency nor to load rating. Therefore Brodmann makes use of sophisticated diaphragm technology as well as specially-made voice coils and voice coil mounts. Brodmann, the manufacturer of world-famous grand pianos, treats its loudspeakers like instruments. The same premium quality is used for the cabinets, Acoustic Sound Boards, drivers and every other component. The cabinet walls are made of high-density, specially coated wood – the same wood used for piano lids. The fine art of hand-crafted piano construction goes into their finish. The cabinet body is first sealed either in standard black or a custom color and then numerous coats of polyester-based piano varnish are applied. Finally, the surface is polished to satin finish or high-polish using a special ‘wobble’ technique. The Acoustic SoundBoards (the side-mounted diaphragms radiating sound in the lower frequencies) are available in classic black finish or in one of the finest veneers from our grand pianos – in aged Tibetan pomele, birds-eye maple, burl walnut or burl birch, for instance. The Brodmann wood specialist carefully selects each fine veneer by hand. Veneer application is a Brodmann speciality. Only a handful of experts are proficient at this technique. Veneer application encompasses more than precise side-by-side placement of veneer strips; the veneer’s grain creates harmonious surface ornamentation that is as natural looking as wood itself. The veneer design unites each speaker pair to create individual harmonies. After the veneer is glued to the Brodmann Acoustic SoundBoards, the edge work begins, followed by polishing. Finally, piano varnish is applied to the veneered boards. The process is the same for the front components. It is simply untrue that ‘everyone hears differently’. The truth is that we hear ‘digitally’ rather than ‘analog’, since from birth onwards, we have been storing acoustic signals in our ‘computer‘. We analyze these stored signals using criteria such as pitch, volume, color, pulse, etc. as well as psychological impressions such as warmth or coolness and feelings of fear or joy. All of this is accomplished by our modulation perception. Although fingerprint and ear shape differ from person to person, our aural recognition faculty compensates for this. Otherwise it wouldn’t be possible for different people to recognize someone’s voice. Good taste is actually objective, the prerequisites being training and a little practice. Only when errors occur do our impressions tend to be more subjective, ultimately leading to individual evaluation – what one likes or dislikes. Therefore we can confidently claim that a good sounding loudspeaker, properly demonstrated, will please music lovers everywhere. The specialty of Brodmann’s sound is the reproduction of an instrument’s original timbre and the artist’s musical expression (true-to-life performance). This is achieved by reproducing the original resonances without the over-resonances. Also the Acoustic SoundBoards [2,2, 2,3] obvious still do not have the dimension of music instruments with their much greater areas and even less they reach the expansion of orchestras. But just they adapt the sounds lower frequencies on the dimension of listening room, leaded without distortions [APPENDIX B, ‘horn function’]. The remaining sound lead, around the loudspeakers, will take over now from the floor area around the loudspeakers and the limit expanse of the listening room. To give right dimension the expansion of the room part, which is leading the sound (the whole area of room limits would be much too great), by loudspeakers self is to look for the right placement. Further the result is depended on listeners position. Leaving the sweet-point in the room centre and with approach to the room wall or/and – in case of a low upper limit – almost to them (by stand up from sitting place) the part of room, which is effective as sound lead will expands (including its vibrations). The result of them is a more and more dull sound stage in direction to lower frequencies. Its coming to a maximum outside the door of listening room. Note: Music instruments, in their original dimensions, do not need support for adaptation of sound transformation to listening room and so they will not placed near to the floor or limit walls. Below described effect so here appears very much less. So the placement of your speakers in the listening environment is the most critical factor when setting them up. The more sophisticated the loudspeakers, the more sensitively will they react to the room (only inferior speakers sound the same everywhere). If the listening room is not perfect, unwanted floor and room resonances (footstep noise and standing waves) may be transmitted. Brodmann loudspeakers do not require placement in the middle of the room; they are designed for placement near walls, as it is the most common practice. 1 Place the loudspeakers in the classic stereo triangle arrangement. 3 Rotate the loudspeakers on their vertical (radial) axes. loudspeaker has bass drivers on both sides (VC 1 only has them on one side, but may be treated in the same way as the others). When positioning, take care that the distance to the nearest obstruction (wall, bookshelf, etc.) measures at least 23 cm, otherwise the sound will seem ‘tired’. Brodmann loudspeakers and cables are designed for use in normal living rooms. Under difficult room conditions, however, the following measures may be taken to offset undesirable room effects, i.e. footstep noise or standing waves. a) Tighten the spikes as required; tightening has an audible effect and further separates the speaker from the floor. This eliminates unwanted resonances, yet can make the sound ‘thin’ if spikes are over-tightened. Klangbild aus. b) Set Diamond Plugs to muffle floor and room resonances (also see 8.1). d) Separate the loudspeaker cable from the floor by using Acoustic BalanceFoam (also see 8.3). e) Improved separation of the loudspeakers from the floor by Acoustic BalanceBases (also see 8.4). As with all fine-tuning measures, ‘more’ is not better. The correct degree of adjustment is crucial. „Brodmann Diamond Plugs“ can counter a muddy, imprecise sound in the bass range caused by floor or room characteristics, especially when spike tightening and other counter measures fail. These ‘intelligent’ resonance dampers produce effects similar to moving the loudspeakers forward in the room or tightening the spikes. If these measures are used together, their effect is compounded. The plugs are either screwed onto the spikes from below or, for maximum effect, screwed only a few turns onto fully tightened spikes. Warning: Under normal room conditions, excessive disconnection of the loudspeakers from the floor makes the fundamental tones ‘thinner’, depriving the sound of its original fullness. The same effect can be observed if the loudspeakers are placed too far forward in the room or if the spikes are over-tightened. Brodmann loudspeaker cables were developed in nuclear physics laboratories in the USA. They significantly augment the effects of the Acoustic Active Principle. These cables feature a number of exceptional qualities and are also used by NASA. Key Features Single strands made of oxygen-free tempered copper pulled into a particular crosssectional form. Each strand is encased in iridium to enable maximum conductivity, particularly on the wire surface, and to take advantage of the skin effect. Both the single strands as well as the positive and negative lines are in line with the geo-magnetic field. The cables are available in multiples of 120 cm lengths. A protective casing shields them from external influences. The cable’s casing is made of 100% weather-proof, non-porous plastic with a transparent finish – the same cables are also used for internal loudspeaker wiring in order to optimize the signal path. The ‘S2’ model is recommended for use with WALL and VC 1, the ‘SA’ model for use with CENTER, VC 2 and VC 7. Our cables also feature original laboratory-quality BFA plugs, which guarantee optimal contact with the Brodmann input jacks. Cable Placement Tips: The cables should be placed with the text direction towards the loudspeakers. As with every fine instrument, cables and loudspeakers need to be broken in. We recommend playing music with natural instruments (i.e. orchestra, jazz trios, big bands or, most natural, vocalists) for a period of about 48 hours. Normal volume is sufficient. In our experience, the sound will continue to improve in the following weeks, reaching its peak performance in about one month. With this new technology the sound of quality loudspeakers still another good step can be greatly enhanced. Introduction as technical description see under appendix B. The Acoustic Balance Foam are foam objects of approx. 7 mm thickness and extraordinary molecular density. They are positioned under the loudspeaker cables at 10 cm intervals. Since Brodmann loudspeakers are such sensitive instruments, they will transmit all resonances, including those that are unwanted or erroneous. The unique Acoustic Balance Bases were developed to optimize loudspeaker performance in difficult rooms. Function and Effect: A loudspeaker ends not at the connectors, but at the amplifier. Loudspeaker and cable form a unit with regard to resonances. Although amplifiers are also prone to resonances, their effects on loudspeakers and cables are more dramatic because they are so closely connected to the floor and room. If tapping on the cable is clearly audible through the Acoustic SoundBoards, this means that one is hearing the feedback produced by the floor and the standing waves between floor and ceiling of the listening room. The entire sound is influenced. Of course, normal footstep noise, such as one finds on a welldisconnected (i.e. concrete) floor, is taken into account at the tuning of our loudspeakers. However, if footstep noise or other room resonances are extreme, then the cables should be disconnected from the floor in those sections where it is required. The results of positioning even one Acoustic BalanceFoam near the loudspeaker are clearly audible. They are a wonderful aid, but placement of too many Bases can deprive the sound of some fullness. More is not better. The correct degree of adjustment is crucial. 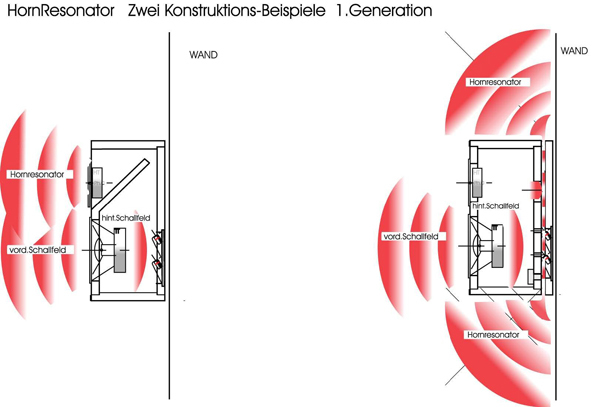 ABB (Acoustic Balance Bases) are also a tool to take away too great vibrations of rooms. This ground-base, to set under each of the loudspeakers, is formed as a sandwich of steel and high compressed MDF material. For the right use of the ABB there should already be fixed Black Diamonds on the Speakers. These Diamonds fit perfect in the immersions of the ABB. The result is similar to Black Diamonds, but much stronger in effect! It is to use at a time the room- and floor condition it makes necessary. The HD SUB-WOOFER – the most musical sub-woofer in the history of bass reproduction. With the SUB-SYSTEM creative users have several possibilities for system enhancement at their disposal which will lead to an intensification of the listening experience. a) 1 SUB-SYSTEM is placed vertically near a corner of the room or against a wall. It can also be located horizontally, for example, under a video display. b) 2 SUB-SYSTEMS – for example one loudspeaker in each corner is very pleasing to the eye, like two decorative columns against the wall. c) 4 SUB-SYSTEMS and two plus two sereo-amplifiers – acoustically this version produces absolutely maximum system power! Two SUBS per side support the sound coming from the left and right of corners of the room and produce more energy than a large horn, as the special membranes (the aforementioned Acoustic Sound Boards) cause the air in the room to vibrate in a more homogeneous manner. This version optimally satisfies the physical demands for a greater degree of adaptation to the lower frequencies (instead of the normal situation of a speaker cone working far too hard to compensate for a lack of cone area, which tends to produce a rather “nervy” bass reproduction). Make sure that the electronics are placed on a solid and stable base (rack), in the moste cases using Black Diamond Coils under the amps. Connect the sockets PRE-OUT of your current amplifier or receiver (or your pre-amp) to the INPUT of the SUB – amplifier. Provision has also been made for a switchable XLR connection to the SUB-SYSTEM. If a PRE-OUT terminal is not available or already in use, connection can be made via loudspeaker cables. This can be achieved simply by the use of two further loudspeaker cables which are likewise connected to the loudspeaker terminals of your amplifier and then directly to the impedance –corrected loudspeaker input sockets of the HD SUB – ELECTRONICS. Please on no account use the TAPE OUT sockets, etc. As these outputs deliver a signal which cannot be adjusted via the volume control. Connect the loudspeaker cables of the SUB to the SUB–SYSTEM amplifier (watch for + and - ). Now press the ON button for immediate listening pleasure. Class D amplifiers are extremely efficient. They deliver a high output and remain relatively cool. Nevertheless no installation should fail to provide for adequate air circulation. Another tip: use good interconnect and loudspeaker cables in your system. We offer outstanding cables which suit our loudspeakers. Try also power cables which have been optimized for sound – here too we can recommend our brand new “power cable” which guarantees fantastic dynamics. The cable consists of artificially aged copper (25 years) which has been coated with pure silver and iridium and fitted with a high grade power plug. The secret of the cable is to be found in the combination of two construction principles which modulate each other in an absolutely fabulous way. According to the Chief of Development, Hans Deutsch, this cable endows both integrated and power amplifiers with “a warmth of sound and at the same time dynamics that resemble cannon shots”. With its new Absorber Principle, Brodmann Acoustics takes account of the current audiophile trend towards removing unwanted resonances from the listening environment. The dynamically oscillated layered wood construction is finished with high quality pear and maple veneers and has dimensions approximately 150cm x 180cm. The Absorbers clean up and noticeably improve the quality of the sound through absorbing the fundamental tone area between 35Hz and 160Hz and dispersion in the formant area 160Hz to 2000Hz. The effect is roughly a 10dB reduction in the critical boom region by the first element and 40m2. This effect can be enhanced by the addition of further elements. The elements stand securely on their heavy feet in front of the wall and can be arranged according to personal preference in a circular pattern or in a wave formation (each second element is turned 180º). Brodmann WALL for wall mounting (mounting materials are included with every loudspeaker). The preferred model for surroundsound/ multichannel systems. Like all Brodmann loudspeakers, WALL speakers are equipped with a HornResonator for optimal bass reproduction. The HornResonator begins on the rear side of the cabinet (see circular opening ‘do‘). WALL speakers are placed at a distance of only a few millimeters from the wall. The HornResonator exists in this space between the placement wall and the rear of the speaker, projecting the bass tones around all sides of the loudspeaker. Brodmann CENTER for use as a center speaker for surround-sound/multichannel systems or as a shelf speaker. Following the guidelines in sections 7 and 9, CENTER may also be placed in a cabinet, on a shelf, sideboard, or speaker stand. Brodmann VC 1 created both as a ‘design piece’ and with practical placement in mind. Sound characteristics are identical to those of the VC 2 and VC 7 models. Brodmann VC 2a slim loudspeaker with a powerful sound. Brodmann VC 7 the ultimate in concentrated dynamics as well as beauty and realism of sound. For set-up, please refer to the guidelines in sections 7 and 9. However, since these speakers are the most sensitive of all, even a few millimeters of difference in the distance to the wall will be audible, and so they will require some extra fine-tuning. A step-by-step set-up guide with a manual is provided with every loudspeaker pair. Bass tones are projected - on a large scale with excellent adaptability levels - from the two side-mounted fo-tuned Acoustic SoundBoards, which also function as passive diaphragms. 1 The resonator’s diameter (do, d//, de) determines the (distributing) fundamental resonance (fo). 2 The resonator’s circumference determines the level of adaptability to its surroundings. Of course the size of the Acoustic SoundBoards in conjunction with the air mass used (see fig. 1) causes a dramatic increase in the level of adaptability (see figs. 2-3). Furthermore the precisely defined active/passive resonation of the panels – as with Brodmann pianos – results in a significantly more ‘musical‘ sound while simultaneously damping unwanted overtones. The Acoustic SoundBoards are true diaphragms that serve to project primarily bass tones. They are the equivalent of 1500 mm in diameter, an incredible size which greatly increases the level of bass adaptability to the room. The HornResonator side panels (the Acoustic SoundBoards, adjusted to fo) cause the bass tones to increase in dimension and to adapt extremely well to the listening room. The Acoustic SoundBoards are true diaphragms and their clamping screws (6 per panel) have been adjusted to 90 cNm for optimal sound reproduction.